Too much heat could mean bad news for your PC or laptop. Follow our top 10 cooling tips and help your PC keep its cool..
1. Give it Some Room : Let’s start by looking at a few principles of cooling. Your computer lowers its temperature by using air drawn from the surrounding area. Stick a desktop PC in a corner – or even one of those little cubby holes you End in computer desks – and you’ll end up with insufficient air-flow to keep your PC cool. The air around it – with limited circulation – will warm up, meaning it will be less efficient at chilling those components. A laptop with missing feet, or one surrounded by general desk litter, can have the same issues. Make sure there’s a good couple of inches clearance around your desktop case, prop up that laptop, and check that all vents and fans are free of obstruction. Give your machine a regular clean inside and out. 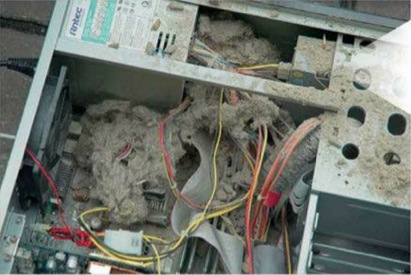 Dirt dust and hair (pet or human) can stop fans working efficiently and over-insulate vital electronic components. Start from the outside of your machine, cleaning out vents and fans with a vacuum cleaner hose. Inside the case, carefully blow away excess detritus with canned air. You should be able to get it from an electronics or art supplier for a relatively decent price. Don’t be tempted to blow on components through pursed lips, you’ll just glue the dust in place with spittle. If you assembled your PC yourself from scratch, you may have gotten a few things mixed up completely inadvertently. Most PC builders know to fit one or more case fans to their systems, but not everyone knows which way round to put them. 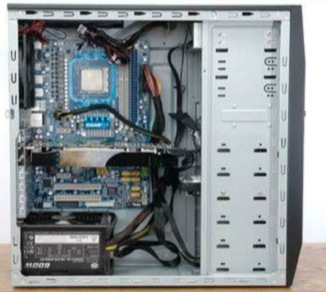 It’s best to have one positioned at the side – preferably over the CPU – sucking air into the case. The second can be on the opposite side or the back of the case, venting hot air out. This arrangement should create a constant stream of air flowing over your components to make your PC run cooler. Try flipping a fan over if you suspect things have gone wrong. You may know that your computer or laptop is running hot. But which components in particular are the culprits? Most often it’s the CPU, but what if there’s a faulty case fan or hot video card in the mix? Free software Speedifan – download it from Almico – will help you identify the hot spots in your machine. As a bonus, it can control the working speed of your fans, as well. Be careful though, slowing down a fan to make your computer quieter could end up making it hotter. So use it, and similar sofware, with caution. Adding extra case fans can improve heat dissipation. Extra exhaust fans will drag more hot air out of the case, while extra intakes will pull more cool air in. Make sure you add them sympathetically and don’t disrupt the overall airflow. For example, a second fan placed next to a inlet fan on the side of your case is ideal, as long as it’s pulling air in. If the new fan is an exhaust, you’Il create a little pocket of airflow inside your machine that won’t actually do anything to cool your components. Imagine the path that air will take as it travels through your machine – you’re aiming to have it sweep over everything that’s hot. By the same count, running a desktop PC with the side off is a particularly bad idea. You might think that it will leave your components cooler, but without that air flow they’II heat up. Modern video cards can rival your CPU for heat output. Some have built in fans, but some rely on passive methods of cooling – like a simple heatsink, an array of copper hns which draw heat away from processors and other hot chips. Either way, you can help by installing a cheap and cheerful PCI slot exhaust fan – available for around £5 from www.amazon.co.uk – which is specifncally designed to draw heat from card components and eject it through the back of your PC Just make sure it doesn’t upset the overall air-flow. Laptop computers aren’t quite so easy to crack open and customise, but you can help cool a hot notebook with a bit of external help. You could use a DIY method: stop using your laptop straight on your lap, for instance, to reduce the risk of covering essential vents with your legs. Try lifting your laptop further up from the desk with a handy prop or even a wire rack. If all else fails, 8eIkin’s range of USB powered laptop cooling stands are inexpensive and work well. Since they’re USB powered, you won’t need an external power supply to keep your laptop chilled, although you may notice a slight drop in battery life. The following tip is only for those comfortable with advanced computer repair. If your CPU is running too hot, it could be that the contact between the heatsink and CPU is poor. To remedy this, remove the current heatsink and fan, then carefully wipe the existing layer of thermal paste from the CPU with cotton buds and a little surgical spirit. To clean up the last of the residue, use a piece of kitchen towel. Take care not to get the grease on any other components and don’t press down too hard at any point. Apply a new, thin layer of thermal paste to the top of the CPU, making sure it’s distributed smoothly and evenly. Finally, reflt the heatsink and fan and you should find your CPU running cooler. If your computer’s CPU is currently being cooled by a standard issue heatsink and fan, you can upgrade to a more effective and expensive solution. Third party heatsink and fan combos can cost as little as £10, or as much as £100 for the most extravagant models. We’d recommend starting at the £30 mark for more effective replacements for a generic heatsink. When you’ve got your new fan, just follow the instructions in step eight to cleanly fit it to your existing CPU. Once a truly industrial solution, water cooling systems have come a long way. They are no longer just for DIY hobbyists. either – they’re simple enough for anyone with enough guts to lit quickly and easily. Furthermore, they make the inside of your PC look particularly cool as well as reducing the temperature. You can find a range of ready to fit kits from £56 up to £346 at www.specialtech.co.uk, or search for ‘water cooling kit’ on www.amazon.co.uk for cheap deals. There is one slight problem with water cooling kits: they use water, or special coolant. Inside your PC. Next to all of your vital, water-sensitive components. Although their design should preclude any interaction between the wet stuff and your precious chips, make sure you’re completely conhdent before taking the step to lit one, and ensure that your case is big enough to accept the pipes required.